Michele’s first appearance on The Last Word was in the “preview” episode (filmed prior to the series premiere and aired as a Fox Special Presentation). Although she takes part in the first round of three words, Michele doesn’t take the first turn. However, she does correctly identify the first word of the series with very few letters. The first word is WASHER. Having correctly identified a word, Michele has the chance to try for another word. Without any additional assistance she correctly identifies it as DRYER. The third word is much more tricky and is eventually identified by Michele’s opponent as QUARTER. Despite identifying two of the words, Michele loses the round because her opponent won the “Last Word”. During the second round, Michele’s contestant plays against actor Jamie Farr who is identified as an old hand when it comes to word games. This round is lost to Jamie Farr and so there is no third round for Michele to take part in. "By the way, Michele - you're coming up with a brand new series on the 'Fox' network called Alien Nation." "Let's talk about that for just a second... I hear it's very different?" "It is pretty different, yeah. I play an alien on the show... Actually, I think you've got a clip..."
"A good show... And we'll be watching it Monday nights on the 'Fox' Network. Congratulations and good luck with it." The game continues with Michele and her contestant’s opponents racing against the clock for sixty seconds. With Jamie Farr’s help, they win all the prizes. 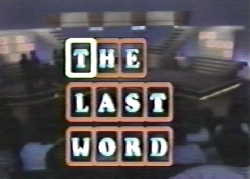 The next round of the game is identical to the first with the one exception that the celebrities swap places – so that Michele is now with the winning contestant and Jamie Farr is with the losing contestant. One round of “three words” is played between Michele’s new contestant and Jamie Farr. Unfortunately, just as the second round is about to begin (between Michele and her opponent) time runs out and so Michele isn’t given a second chance to play the game. During this game Michele does appear to be enjoying herself and it’s a wonderful feeling to travel the time warp into the past to experience a time before Alien Nation became the recognised name that it is now and before Michele, herself, became so recogniseable as Susan Francisco.